central square is characterized by two leaning towers which you can climb for a panoramic view of the city, perhaps catching a glimpse of the students hanging out in the piazza, or a communist flag (Bologna is a stronghold of Italy’s communist left). Gaze up while strolling the covered sidewalks, which all have ornate ceilings, and were designed to allow dry passage through one of Italy’s more rainy cities. Visit the oldest university in Europe, or just wander the historical center where you’ll find gardens, monasteries, and, at night, a thriving nightlife animated by the young Italian students who still flock here to study. An amazing city filled with culture and a vibrant night life. It’s a shame that the local government doesn’t do more to keep the older buildings in better condition, as quite a few are falling apart. When I visited the streets would heave at night, and there’s an abundance of local spots to explore. Bologna is a very charming city that has a very local vibe compared to other tourist locations in Italy. The food is amazing so be prepared to eat most of tortellini, bolognese sauce, and lost of mortadella meat. I would recommend one night at most to see the main sights unless the museums seem interesting. Bologna is a beautiful town. Only recently discovered by the international tourism, it hosts the oldest university in the world (A.D 1089) and an incredible amount of ancient buildings, museums, views and, yes, restaurants. Just turn off your electronic devices and dive in its medieval streets and "portici". I am so happy we got to stop in Bologna! What a gorgeous city with impressive architecture, food, and shopping! There are covered walkways, unique to this Italian gem and very upbeat feeling to this college-clad city! The capital of the area, full of life and events, it has one of the oldest universities in the world. ALso famous for its pasta dish TORTELLINI. If you haven't had the chance, Italy is the place to go. It's not only a country filled with history, culture, and food, the general aesthetic is one that is calming and communal. Many people will tell you to go see Rome, Firenze, or Venice and while I agree that those are lovely places, they are not on the top of my list. If you're going to Italy, you need to check out Bologna. Bologna is a city that serves as a happy medium between the large cities of Rome and Firenze and the small coastal towns. It is the home of the world's first university, a building which houses seven churches, and a land with an influx of refugees. It also was the place, in my opinion, that helped me to better understand Italian culture as it is not overly touristy. If you have time, definitely go see Bologna! 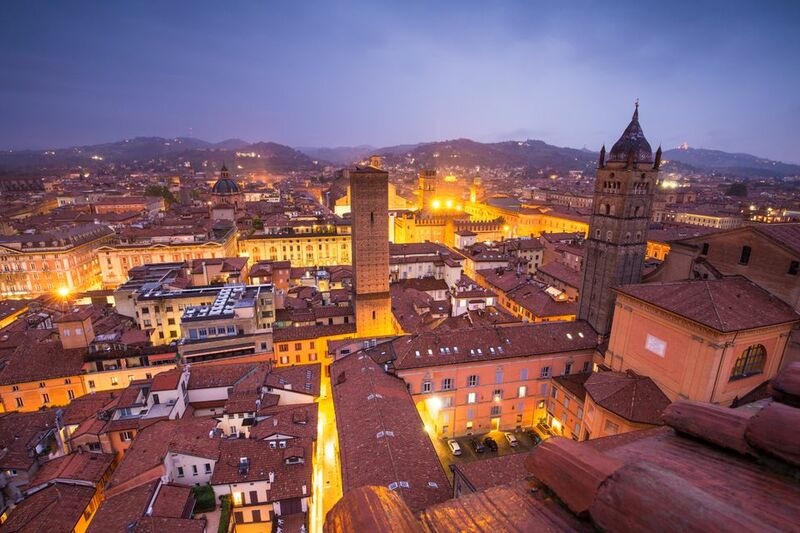 Bologna is home to a very old university, the students of which still spill into the streets at night. The covered sidewalks make umbrellas largely unnecessary. Climb up the two leaning towers in the center for a rickety experience and great view. If you can escape into the hills for a meal, do, as the emilia-romagnan cuisine is arguably some of Italy's best, and it's always at its most authentic and abundant outside of the city walls. Bologna is the seventh largest city in Italy, like its neighbours in the north, the food and wine are fantastic. The eldest university in the world is located near to the city centre and it helps keep a young and vibrant feel to everything. Its ranked as one of the most affluent and most pleasant cities in Italy. With around one million people ( 85,000 of who are students ) the city is modern, vast and wide. The main centre is however fairly small and stands with in the old city walls and the circular dual carriage road. It has a range of large and impressive buildings, a cathedral that was to be bigger than St Peters in Rome and some lovely squares. The most noticeable thing about the city to a visitor is its covered walkways and many towers. With over 24 miles of covered walkways / porticoes, you can traverse the city in most directions without being exposed unduly to the wet or the sun. It is odd at first, but in the heat of the day or in the rain, rather nice to be covered. The many towers ( once over 120 ) dot the landscape and from the hills around make a wonderful spectacle. Some of the towers have public access and some are leaning so much I cant see them standing for much longer. The city is home to the eldest university in the world and this gives the city a feeling of youth and sophistication. Its not heavily visited, with tourists choosing to head to Verona and Florence which is very understandable as they are wonderful places, but for a few days its well worth a trip. It has a good airport very nearby with a cheap bus service ( BLQ ) serving the city every 15 minutes or so. In terms of history, cuisine, culture, and the Bolognese themselves,. I gave Bologna a five star rating. However, it is important to keep in mind that it is a communist city, in that it is run by communists, for the benefit of communists. The decay in the city is readily apparent, and it reminds me so much of my experience in post-communist Russia, right after the communists were thrown out of power in the early nineties. Home to the world's oldest university, Bologna is an ancient city in the Po Valley. Very hot in summer, but staggeringly beautiful old city and vibrant university quarter. Unfortunately, it's a bit rougher than Milan.